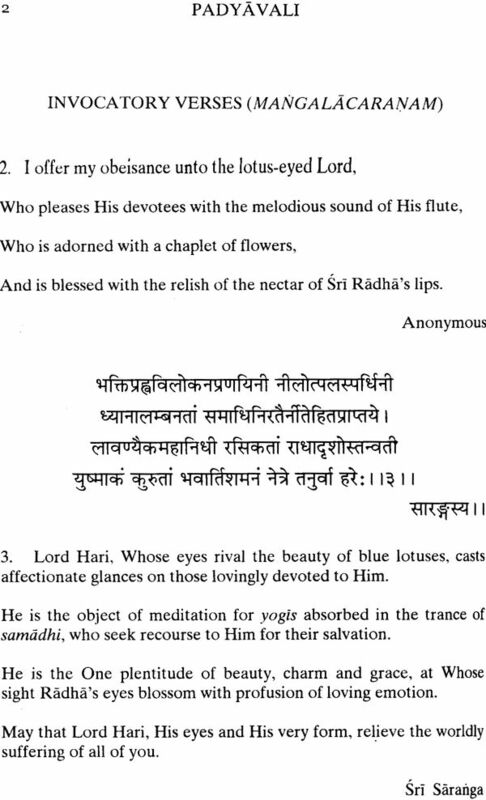 The Padyavali, complied by Sri Rupa Gosvami in the sixteen century, is perhaps the only anthology of devotional verses in Sanskrit literature. 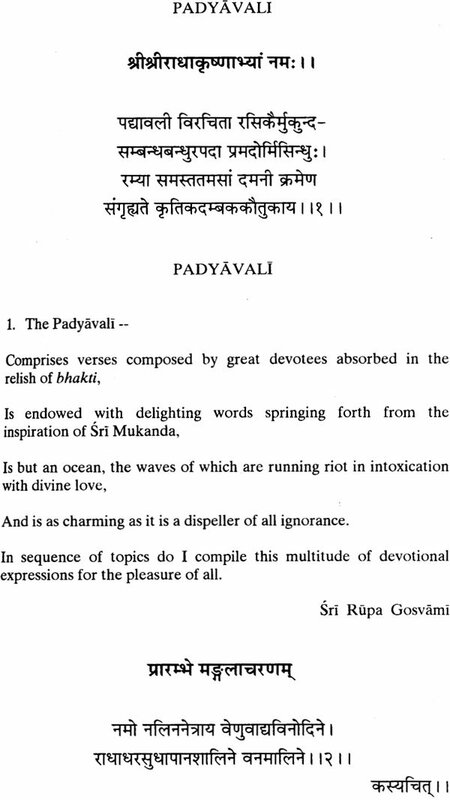 Comprising expression of over a hundred poets, the padyavali is imbued with devotional sentiments, beauty of expression and with an engaging gracefulness and charming innocence. 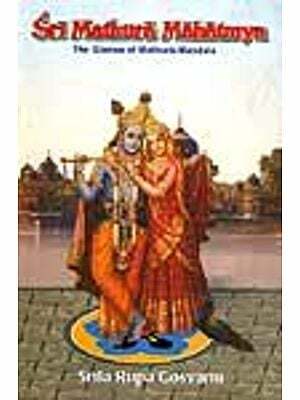 This unique book has served generations of devotees in appreciating the depths of Divine Love. It is intended that those in quest of spiritual perfection, will be inspired to seek the esoteric, yet accessible, realm of Krishna Bhakti. The Padyavali is an anthology of devotional verses in Sanskrit coplied by sri rupa Gosvami. 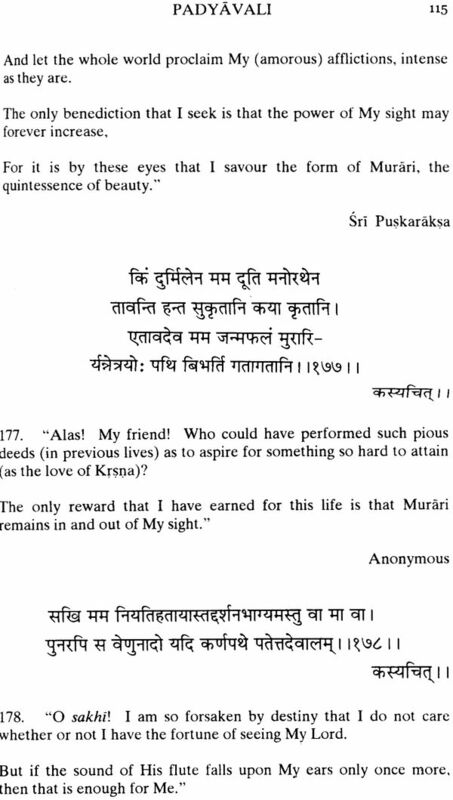 Sri Rupa was one of the six principal associates of lord Caitanya Mahaprabhu (Ad 1486- 1534). Lord Caitanya was the founder of the Gaudiya (or Bengal) school of Vaisnavism. Rupa Goswami has chosen 388 verses composed , in various meters, by a little over a hundred devote poets. The Verses are placed under several headings and deal with various aspirations of devotees ad of the deeds and exploits of Lord Krishna and his Associates. 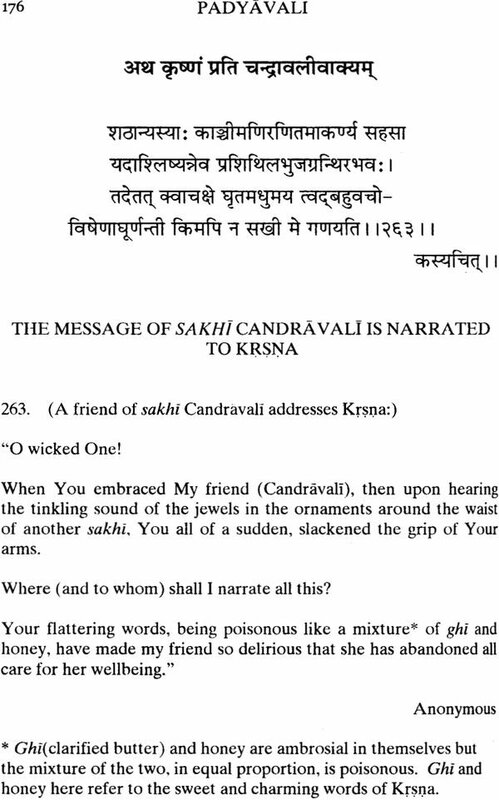 The rubrics are so chosen as to structure the text beginning with general principles of bhakti, interspaced by narrations of pastimes of the Lord, culminating in expressing the superlative from of the love of radha the gopis for krsna. I have assumed that the reader is familiar with the personality of krsna and the happening of his life when he incarnated on this earth. The reader will, perhaps, be served best without an elaborate introduction or detailed comments on the verses. Sparing the reader such ‘guidance’ would enable Him to see the verses. In the simplicity, innocent charm and emotional appeal, just as I discovered them. In this way the reader will also be able to appreciate the genius of the complierin creating a collections of verses in logical structure and smooth harmpny. 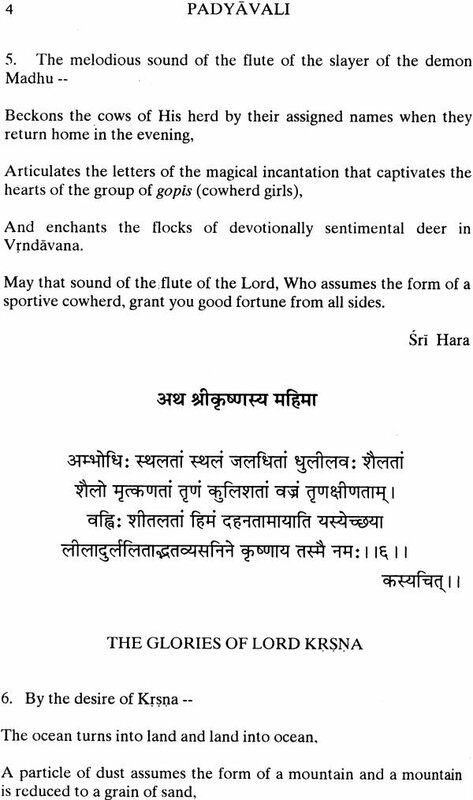 The Six goswamis of vrndavana, along with several other devotees of Lord Caitanya, have written an enormous amount of literature of the Gaudiya Vaisnava Sect covering virtually every branch of classical Sanskrit – philosophy and theology, poetical narrations of Krishna’s divine lilas, drama and dramaturgy, ritual and codes of conduct , grammar, rhetoric and poetics, and prosody and music. 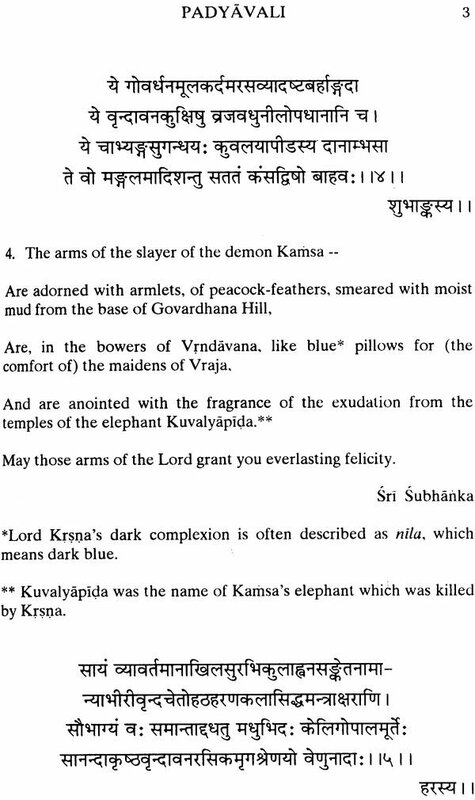 Of the six goswamis, Sri Rupa’s contribution to this vast literature is substantial and unique. Sri Rupa Goswami was a Karnataka brahmana whose ancestors migreated and settled in Bengal. He and his brother Sanatana Goswami were high officials at the court of the Muslims ruler of Gauda (Bengali). Although they did not convert to Islam, they had accepted the Muslim titles of Dabir Khas and Saker Malik respectively. The two brother enjoyed immense authority and parks of office under the muslim ruler and had also acquired considerable wealth. But when they met Lord Caitanya, He so enamoured them by His personality and His teachings, that they then on it was only pure, blissful Krsna bhakti for them as taught by their Lord. 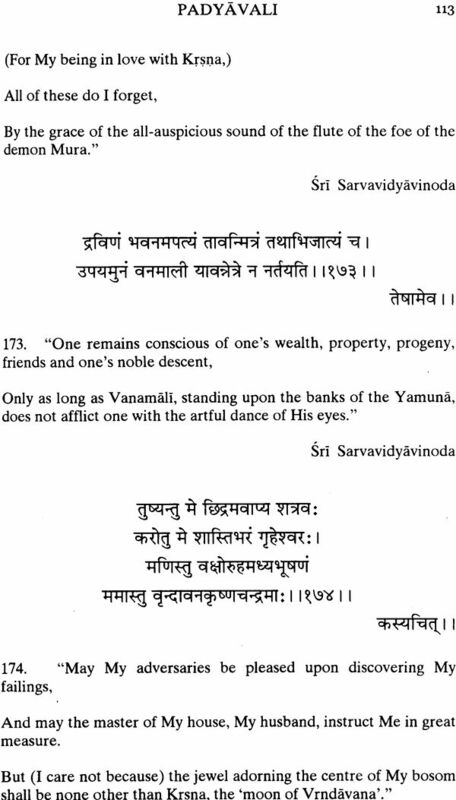 It is difficult to find suitable words within the English language, to describe adequately the depth of feeling and emotion of the authors of the verses, for it is best imbibed in the original Sanskrit. While translating the verses in to English I have tried capture the mood of the devotees, as best as I could. 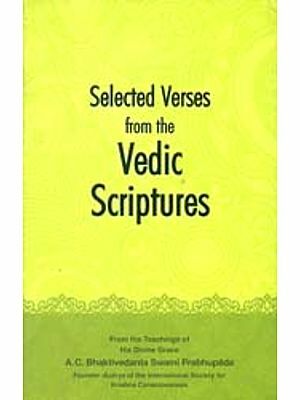 It is hoped nevertheless that the readers of this beautiful transcendental anthology will be able to relish much of the sentiments of divine love expressed in them.